A feature story in last Sunday’s Dallas Morning News brought back a flood of nostalgic memories. The article was about the famous painting of Jesus by a graphic designer named Warner Sallman in 1940. I’m sure you’ve seen it. It was ubiquitous in the second half of the twentieth century; I remember it hanging a number of places in family members’ homes, as well as a few churches I visited. It’s a … shall we say, “pretty picture” of Jesus. Jesus has flowing brown hair, a full beard, and blue eyes gazing off into the distance. His lips are slightly pursed, as if he’s about to say something calm and soothing. If by “weak and emaciated” Graham meant non-white, then he would have been spot on. Because this famous painting is nothing like the historical Jesus, of that we can be sure. The real Jesus was born in Palestine and was certainly darker than the famous picture, no matter that Sallman claims that he was inspired by a dream in which he saw Jesus. Since we don’t have a clue as to what Jesus really looked like, the truth is that any drawing, painting, or sketch of Jesus tells us more about the artist and the person viewing the art than it does about Jesus. It’s hard to imagine Sallman’s Jesus making too much of a fuss. Instead, he appears as a very loving, personable figure. And that is entirely in keeping with the Christianity of the time; Jesus was consistently preached as a sentimental figure who loved children and animals and would ultimately lay down his life so that those who believe in him would have their sins forgiven and live in heaven with him. This was the version of Christianity that was especially popular in white America at the time. 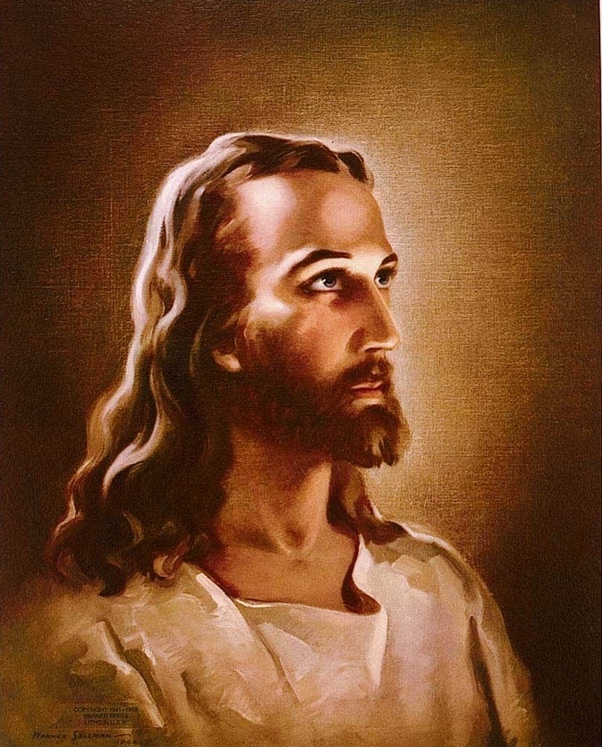 This was the Jesus that Americans wanted to believe in, and the fact that this Jesus was a Scandanavian-looking white dude made the whole idea palatable to the white church. However, Sallman’s picture overlooks a vital aspect of the historical Jesus. The man from Nazareth spoke and acted in the tradition of the great Hebrew prophets, the rough-edged proclaimers of justice in the face of the world’s illegitimate powers. In the midst of the Civil Rights movement in the 1960s and the subsequent anti-war drift, Protestant Christianity began to fracture between those who continued to think of Jesus in terms of Sallman’s vision and those who … didn’t. I would argue that Sallman’s picture is sadly dated and largely irrelevant to our world. Not because Jesus’ hair is out of style, or that he is simply too white. But because what the world needs now is not a sanitized, BFF Jesus and pie-in-the-sky Christianity. What the world needs now is more of the prophet Jesus who would be angry that children are being torn from their parents after fleeing from war-torn homes, who would be incredulous that children don’t have enough to eat in our cities, who would be outraged that we spend so much money on frivolous leisures, dangerous habits, and military hardware. Now I’m not saying that Jesus wasn’t a loving figure, nor am I saying that we don’t find forgiveness of sins in him. I believe in life after death, too. These are all part of the Christian faith. However, they aren’t the total picture of the faith. If we are to have a balanced faith, then we have to come to terms with Jesus the prophet, Jesus the troublemaker, Jesus the justice-seeker. And a picture like that might not be very pretty.